120 youth and adults took to the hillsides at the City of Boise’s Hyatt Hidden Lake Reserve in October to create healthier habitat for birds and reduce fire risk. Armed with shovels of all sizes, trowels, and even a post hole digger, the determined volunteers dug through the rocky soil to plant nearly 2,000 native plants. The community planting days were the final public activity for the Hyatt Multi-Cultural Habitat Enhancement Project. The project is led by Land Trust of the Treasure Valley, Boise River Enhancement Network and City of Boise, funded by the National Fish and Wildlife Foundation and supported by numerous local partners. Groups from Big Brothers Big Sisters of Southwest Idaho, College of Western Idaho, Xylem Watermark, Boise Veteran’s Administration, Suez, US Fish and Wildlife Service, and Tomorrow’s Hope participated in the planting days along with dozens of community members. The plants were planted along the upper western edge of the reserve and in the area behind the Maple Grove parking lot. Over the last 15 months, hundreds of community members have participated in numerous activities to improve the habitat at the 44-acre urban reserve. All told, close to 3,000 plants were planted including 1,500 fire resistant, resilient and drought-tolerant grasses - Sandberg bluegrass, Idaho fescue, bottlebrush squirreltail, and bluebunch wheatgrass. To crowd out invasive weeds and provide foraging habitat for birds, native shrubs were planted - golden current, woods rose, rabbitbrush, bitterbrush, sagebrush, and oakleaf sumac. Willow and thinleaf alder were planted to improve habitat close to the ponds and yarrow, hoary aster and milkweed were planted to support pollinators. 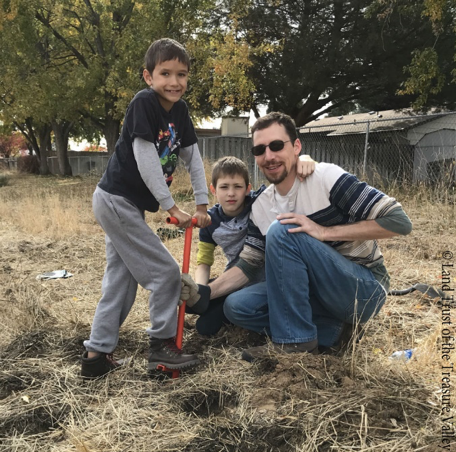 Hundreds of people helped with planting in 2017 and 2018 including the groups listed above and local Rotary Clubs, Boy Scout Troop 100, and the Idaho Fine Arts Academy Interact Club. Plants were donated to the project by Idaho Power, Rotary, and the Native Plant Network. In addition to the plants that were purchased or donated, hundreds of plants now nestled snugly at the reserve were grown by project volunteers. In an incredible display of purpose, volunteers gathered seeds from flowering plants at the reserve in the fall of 2017 and germinated them over the winter. The seedlings were transplanted in the spring and nurtured over the hot summer months. These plants were planted in October. Girl Scout Troop 105, College of Western Idaho, Big Brothers Big Sisters of SW Idaho, new Americans from Nepal and other volunteers grew plants. The Golden Eagle Audubon Society Native Plant Network and Land Trust of the Treasure Valley supervised. Volunteers also helped remove unwanted plants. Employees of Xylem Watermark worked with the Boise Parks and Recreation to take out Russian olive trees and provide space for willows and black cottonwoods. Volunteer Weed Warriors trained by City of Boise Open Space Restoration Specialist Martha Brabec worked weekly to remove thistle, teasel, goat heads and other weeds. The partnership project hosted field trips and birding outings to the reserve, which, in addition to the stewardship activities, introduced hundreds of people to this hidden natural gem. It was common to hear people exclaim that they’d driven by for years and never stopped. The increase in awareness and appreciation for the unique area is vital to ensure long term community stewardship of the reserve. The project also provided new residents from many nations the opportunity to visit the urban oasis and learn about the birds and plants. Volunteers led groups from the Idaho Office of Refugees, the Agency for New Americans and new residents from Nepal around the reserve and provided binoculars to increase the fun. A big thanks to Golden Eagle Audubon Society and the Boise Watershed for helping.